After my father died I went through some of his things, which of course I had never done before. I was surprised how few things he actually left behind. Among his belongings was a small box containing tie tacks and nicnacs and a piece of paper upon which he had typed the above quote. It is from Matthew Henry’s Commentary on Isaiah and while I had no idea why this quote meant so much to my father, it means a great deal to me. I laminated it and I carry it with me every day in my wallet. It is dear to me not just because it came from my father but because I believe with all my heart the truth of those words. I have spent my adult life serving the Church and I believe it has not been in vain. And yet you don’t have to search long on the Internet to find all sorts of predictions of gloom and doom regarding the Church. How 20 somethings are leaving the Church and not coming back. How football devotion is replacing organized religion. NPR recently did a piece on a new atheist movement mimicking the church and calling itself The Sunday Assembly. Add to all of that the priest abuse scandals, TV preachers fleecing their flocks and the terrible divisions in every denomination and it would be easy to believe that we are seeing the Church’s final days. This is where we need the perspective both of the Holy Scriptures and of history. Both of which would tell us that the prophets of doom are premature in their predictions. I want to draw your attention to those last two words. “God’s building.” It could also be translated “God’s dwelling place.” That is what the Church is to be. It is the house the God built. So rather than losing heart and giving up because of all of the base problems at Corinth, Paul continues to see them as the temple of the Lord. He could not have this perspective if they had been built upon Paul or upon Apollos, but they were the Lord’s doing. Jesus Christ is the Church’s foundation. God caused their growth. It was God who formed them into His dwelling place. Paul saw them as a divine work and he wanted those Corinthian Christians to share that perspective. I believe that it is precisely this perspective that is so sorely missing today. Too few see the Church as a divine work if they think about the Church at all. Even many Churchgoers don’t see the Church as she truly is. Why is that? In part because American Christianity is so highly individualistic. People think it’s just “me and Jesus.” Folks today are offended with the idea that there is a body of truth that must be believed and lived to truly be a part of the Church. They want to be left alone to believe whatever they want and then be affirmed for whatever it is that they believe. Worship is emotion driven and focused more on how it makes the worshipper feel than on the honor that is to be ascribed to the One we come to worship. The priesthood of the believer is so overstressed that anyone can preach or administer the sacraments or take authority in the Church even if they themselves are not under authority. For a small fee you can get ordination papers over the Internet. A pastor friend on another denomination told me that when his church members visit someone in the hospital that they park in the clergy parking spaces, because after all we are all minsters. But if we are to truly see the Church as the dwelling place of God, His holy temple, then we must have a higher view of the Church than that offered by American Christianity. The early Church Fathers referred to the Church as the new Eve that is taken from the side of Christ, who is the new Adam. Their interpretation was when the soldier pierced His side the Church was birthed because out of His side came the blood of the Eucharist and the water of baptism. It is this new Eve that is the Mother of all who believe. She nurtures us and teaches us and guides us and corrects us. She is not ours to change, she is not run by a democratic process nor is she a product of the culture. It is this high view of the Church that is one of the many reasons that I am drawn to the Anglicanism. I recognize that the word “Catholic” has a negative connotation for some, but it should not. It is a wonderful word that means “universal.” As St. Vincent put it, catholic is that which has been believed by all people, at all times, in all places. Or I love how one priest put it in an article that he wrote. He said, “Anglicans profess the faith of the one, holy, catholic and apostolic church. That word catholic is a hard one. Loosely translated it means “the whole enchilada.” So we are Anglican enchiladas and not Roman enchiladas but we are enchiladas nonetheless. I have had a number of conversations with folks who claim that they don’t really need the Church. They simply read the Bible for themselves and believe what it teaches. But when I press further to ask about how they go about interpreting the Bible, they tell me that it needs no interpretation because they take the Bible literally. That may sound good and even pious on the surface but what they are claiming to do is not possible, at least not in any practical way. Consider the Gospel for today. “If your right eye causes you to sin tear it out and throw it away….if your right hand causes you to sin, cut it off and throw it away. If we did not interpret this text, but instead took it literally, then Sunday worship would look like a left-handed pirates’ convention. If the motivation to break into groups of belonging to Paul or belonging to Apollos is due, as Paul states, to jealousy and quarreling then that is clearly wrong and is being merely human. 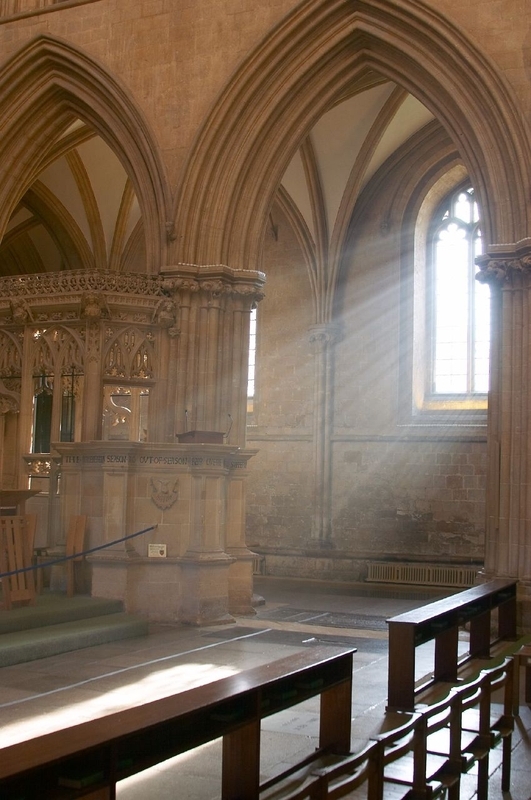 It is not being the divine institution that God calls the Church to be. But if there are distinctions due to diversity, such as Paul being an Apostle to the Gentiles while Peter was an Apostle to the Jews, then the consequence is that the kingdom is expanded and that is what the Church is supposed to be doing. So if I am an Anglican because I am anti-Roman Catholic then I am thinking wrong. That is a result of jealousy and quarreling. But if I am Anglican because I am being drawn by an ancient faith for modern times, then that is the Spirit fitting me into God’s household. Once I know where I fit then I am free to celebrate the diversity of God’s household and work and pray for greater unity among us. It is a given that we are going to have disagreements. It is probably true that the only person that you agree with 100% is yourself. So since that is a given then our task as Anglicans is to work hard at focusing on the areas of agreement within Christ’s Body. We also must remember that we each stand or fall before our own Master so who am I to judge another’s servant? I really like the imagery from Pilgrim’s Progress of the Christian life being a journey. Rather than judging one another as right or wrong we should see one another as being in different places on that journey. The last thing I want to point out from Paul’s words is that we are to ever remember that the Church is God’s building. The Church does not belong to any one tradition or to the clergy or to the laity. It is God’s Church. I had a nice reminder of this a couple of weeks ago. When I was in Atlanta I spoke with the Bishop and Standing Committee that while I celebrated these new young churches coming into our Diocese, I did have a concern that as some of them are trying new and out of the box things that they not dilute our Anglican Heritage. Some are so original in their attempts at planting churches that rather than high church versus low church you were not even certain it was a church. They seem more like a coffee house with a praise band. Just after expressing this concern I drove the next night to the ordination of a deacon in one of these new young churches in Knoxville. I must admit that I went with some trepidation about what I would experience. I had a long drive so I gave myself a long lecture about not judging and being a guest in someone else’s home and not expecting everyone to have the same love of liturgy that I did, etc. etc.. The place was lit only by candlelight and it was mostly a young hip crowd. The Bishop gave a brief primer on what we were doing that night because it was not what they were used to. The worship was led by one guy up front with a guitar, which you can imagine is not my cup of tea. To my delight it was a wonderful experience. The worship was sweet, the ordinand deeply moved and the congregation was reverential and joyful all at the same time. If I could only use one word to capture the spirit of the night it would be “kindness,” one of the fruits of the Spirit. The gift for me that night was that is was as if the Lord was putting his hand on my shoulder, and addressing all my concerns about the future of our Church saying to me, “I got this Ray, you can relax.” I needed to be reminded that it is God’s building. It’s not an Anglican building, its certainly not Ray’s building, it is God’s. That is what the Apostle Paul wanted to the Church at Corinth to see about themselves and I believe that is what he would want for us to see about ourselves as well. We are God’s house. Thanks Fr Ray. Clarity, humility, compassion and faith. Loved it.